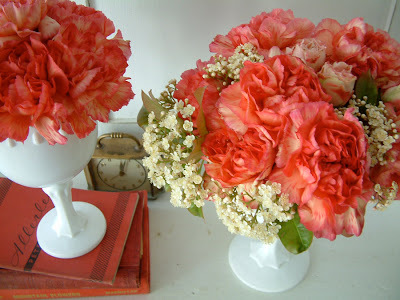 Carnations! I'm so glad someone else sees the beauty. The poor little things have such a bad rep from their years as bad prom corsages and plastic bud vases with a fern a babies breath. Oh, and don't forget about the blue and green food coloring to dye their petals! But their potential is full of promise...pomander balls, frilly arrangements with peonies, your lovely arrangements in this post...I'm going to have to do post soon myself about the poor misjudged carnation.